This lesson includes the anatomy of the lymphatic system. You will learn lymph nodes function, the ingredients of lymph, how the lymphatic vessels move the lymph and how to get the lymph flowing yourself. 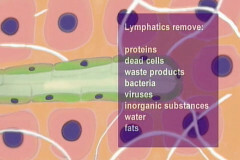 This lesson covers the location of the lymph nodes, as well as the watershed and lymphatomes. Also included are the causes of edema and what it is. This lesson also includes a lymph chart that shows the drainage patterns. This lesson demonstrates the basics of lymphatic drainage massage technique. 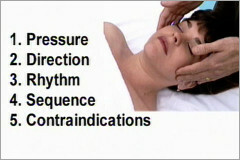 This includes using correct rhythm, sequence, direction and pressure. The main stroke is the J stroke, and this lesson shows how to do it. 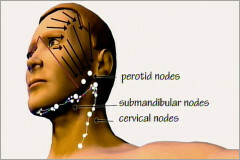 This lesson demonstrates lymphatic drainage massage to the face and neck. These techniques are useful for removing puffiness in the face or under the eyes. The techniques are performed with the client supine, and the work starts at the lower neck and moves up, draining the pathways as you progress. This lesson demonstrates how to perform lymphatic work to the arm and chest. This is vital work for anyone who has had lymph nodes removed from the armpit (perhaps from a mastectomy), and has edema (swelling) in the arm or hand. These techniques are incredibly powerful and safe for this condition. This lesson demonstrates lymphatic work to the belly and leg. All of the lymph from the legs drains into the inguinal nodes, and then deep into the belly. The techniques in this lesson show how to drain the lymph first from the belly, then move down and drain the legs. This is useful for people who have edema (swelling) in their ankles. 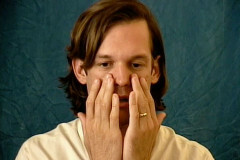 This lesson demonstrates how to perform lymphatic drainage to your face and neck. Working on yourself is a great way to experience the affect of lymphatic drainage massage. You will be able to feel the lymph increasing it’s flow, and visibly see the puffiness reduced from your face. Great to practice first thing in the morning. This lesson incorporates a review of the techniques of lymphatic drainage. It also includes a great interview with Alan Mills, who is a prominent lymphatic drainage therapist. 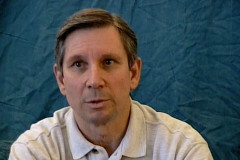 The mixing of his wisdom and Sean’s, gives the viewer a great perspective on lymphatic work.